Managing and controlling your state is a conscious mind process akin to will power, If you have to manage your state or control it, you are not experiencing ‘state choice’. In New Code NLP we focus on ‘state choice’ so an individual is not consciously working at managing or controlling the biological processes inherent in sate. In New Code NLP we have patterns and formats that biologically create a different outcome when a person does not have choice with their state. You may have read my previous articles on New Code NLP where I have written about ‘New Code NLP’ games which are designed to create a ‘high performance state’ to be utilised in any context where high performance is sought after. Prior to the intervention the client may have been having a challenge in a context hence the desire for a high performance state, or the person may be experiencing a level of success in the context but seek different choices which will emerge from a high performance state. a/ A state which engulfs the client so quickly that they get stuck in the state due to the speed they entered into it. Rage and fear are examples of the fast moving state. b/ A state that sneaks up on the client so slowly they do not detect the state shift until they are absorbed in it, and also get stuck. Depression is an example of slow state build which cumulates into a very strong unresourceful state. The pattern called Sanctuary created by John Grinder and Carmen Bostic St Clair is designed to detect the earliest trigger point of the unwanted state and connect the trigger point to a sanctuary state designed and constructed by the client. The outcome of the Sanctuary pattern will be when the client experiences a situation where they would have found themselves submerged in the unwanted state they will automatically access the sanctuary state. The steps of sanctuary are outlined below. 1. - From 3rd position, the client develops visual and auditory representation of themselves in the state that they wish to have choices about entering, independent of context. If the state is extreme you may have to do some extra work to help the client access a clean third. 2. - From third, locate a sanctuary space approximately two metres from the unwanted space. Sanctuary will be an impenetrable space where all resources that are missing in the unwanted state and more are present. The client can build their sanctuary how they desire, they include metaphors such as historical or mythological characters, animals, colours, music, mentors, armour, or of course themselves in an extremely resourceful position. You now have two spaces (the sanctuary space and the location of the state that the client wants choices about) located on the floor. 3. - Step into sanctuary, build the sanctuary by intensifying VAK submodalities and anything else the client seeks to give him/her sanctuary from X. You build qualities and resources useful in Sanctuary. 4. - Step to the side of sanctuary and completely shake sanctuary off. The client sensitises his/her body so they are fully aware of the kinaesthetics they experience in their regular state, the state they are usually in prior to loosing choice to the unwanted state. 5. - From the position above the client slowly walks towards the unwanted state, and the moment they feel the first sensation associated to the unwanted state, they shake it off and jump to sanctuary. A skilled Practitioner with advanced calibration skills, will usually detect when the client first experiences the first touch of the unwanted state before the client is aware. In this case the Practitioner rapidly instructs the client to jump to sanctuary. It’s important to recognise in the Sanctuary pattern the client does not walk towards the unwanted state with resources activated. They have to completely shake sanctuary off so they can detect the earliest kinaesthetic representation of the unwanted state. If they walk with resources activated, they will not be sensitised to the earliest trigger of the unwanted state which is the purpose of the intervention. Also in this pattern the client will not enter the unwanted state, by pairing the earliest kinaesthetic with sanctuary the client will now have state choice. To summarise, a key distinction in New Code NLP is ‘state choice’ compared to the ‘will power’ style of state control inherent in the Classic Code. We all know the limitations of will power. New Code games high performance states to be applied in specific contexts where a different performance is desired. 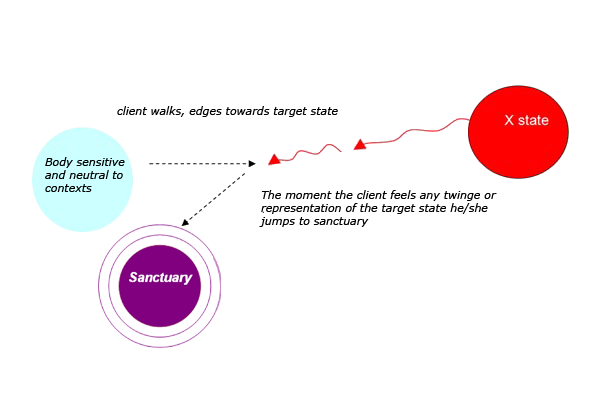 Sanctuary is designed to deal with a state that is present across contexts and will provide the recipient with state choice, where they previously lost it as result of being engulfed due to the high speed they enter the unwanted state or a slow pace where they do not detect the state change until it’s too late.